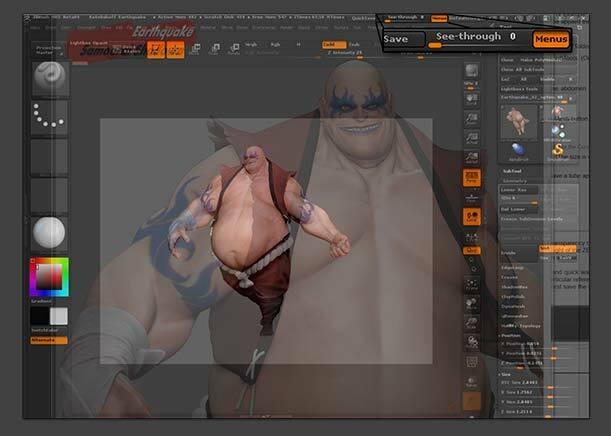 ZBrush has a global setting which defines the transparency of the entire ZBrush application. This See-through slider, located at the top right of the ZBrush UI allows you to see the desktop or other windows through the ZBrush window. One example of how this is useful is as an easy and quick way to display image references. You can use your web browser to find a particular reference image and immediately start sculpting against it without the need to first save the image to your hard drive and then load it into the ZBrush Grid system. When the cursor moves off the canvas area the ZBrush interface will become opaque, allowing you to make menu selections and adjustments. Transparency is restored as soon as you continue working.